Victron Energy make a series of products that are sturdy, well engineered, and have been proven in home and marine installations for several years. They are a Dutch company but they sell worldwide. 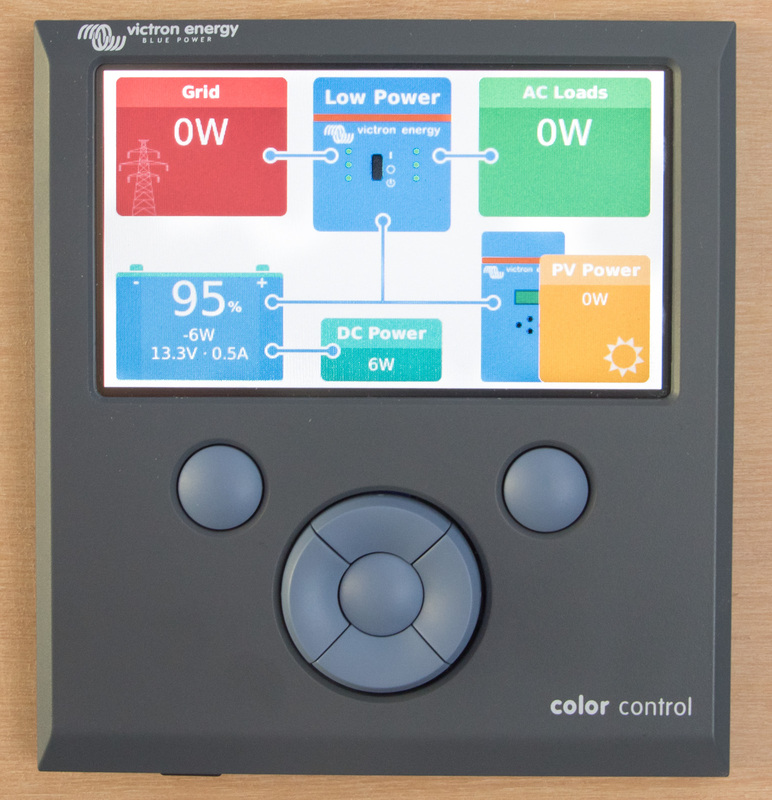 The Color Control GX (CCGX) is the control panel for the system. In the picture above you can see a virtual image of the connected components. The real-life wires actually follow a very similar schematic. From the CCGX you can change settings for the inverter (top center of the screen) and solar controller (bottom right of the screen) through a series of menus. The CCGX also reads from the battery monitor. Not every setting is accessible from the CCGX, but enough to stop you from having to crawl around the devices to perform everyday tasks. The CCGX is also a gateway to Victron’s VRM Portal, where you can remotely check how the system is performing and even update system firmware. This could all be a nightmare of incompatible interfaces designed by engineers rather than human factors people, but Victron have done a good job of hiding the complexity behind a relatively simple user interface. Sure, under the surface there is some scariness. The solar controller uses a different communication protocol than the inverter and the battery monitor. Some of the settings are pretty technical. Some of the error messages are cryptic. But overall the company has done a great job of making things understandable. The other benefit of using components from the same manufacturer is that you can set the system up to do clever things. In combination, these devices can act as an uninterruptible power supply or even be configured to push excess solar power back to the grid. By the way… thank you for your blog! 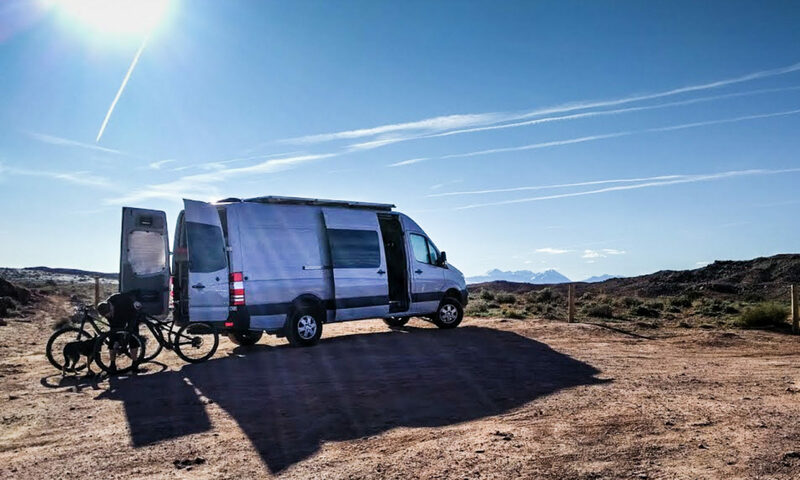 It’s been very, very helpful as I’ve researched my Sprinter conversion. Hey Matthew, we used PKYS.com (Peter Kennedy Yacht Services) and were very happy with his service. I think some of the stuff he sells was drop shipped directly from Victron. His prices were competitive and occasionally he has sales or 10% off coupons. We also used invertersupply.com with no problems, and Amazon because it was the cheapest place to get the BMV 700 monitor. Thanks! invertersupply.com was one of the ones I was hesitant about. There are several reviews around complaining and warning about it. I’ll check out PKYS.com. Yeah – if you look on the invertersupply site, it’s basically listing every single item from the Victron catalog, including ones that are meant for other countries. Doubtful they stock much if any of that stuff. However, when we used them they delivered. I would prefer to use PKYS. He will also answer questions and seems to know what he’s talking about. Hey guys, I’m getting along in the build and about to purchase all the electrical components. I’m following your outline pretty closely, but some folks have recommended not buying a non-victron battery and BMS. However, I see that you guys opted for third party gear on that point, and so far I can’t see it worth the price difference to get the Victron battery/BMS (around $1500 difference). Have you guys had any problems with the third party battery/BMS integrating with your system? Did you mess with a solenoid that could allow the BMS to communicate with the inverter/charger? Or not necessary? My understanding is that basically all you lose is the ability monitor lithium cell levels on the Color Control? If you want total system integration, the Victron battery is probably the way to go. BUT, we didn’t do that and we’ve been just fine. Like you say, the Victron batteries are spendy, and if you add in the cost of their BMS device it soon adds up. We have not had problems with third party BMS integration mainly because we didn’t do it! Our battery comes with a BMS and cell balancing system. It has a contactor switch that will shut it off completely if it gets undercharged or if the charging voltage is too high. That means we won’t hurt the battery. The BMS on our battery also has an OK-to-charge relay and an OK-to-discharge relay. We’ve not done it (yet), but you can connect those relays to the MultiPlus inverter/charger and run an assistant (Victron’s name for a monitoring app) on the MultiPlus that lets it know when it can pull/push power to the battery. That same relay loop could be extended to your solar controller’s relay to tell it to stop charging. So, there are functions built in to the Victron gear that let you do most of what the Victron BMS does. We can still monitor our battery SOC on the Color Control. The BMV700 monitor sends that information completely separately from any BMS function. We can’t monitor individual cells within the battery that way, but that’s what a multimeter is for. You only have to pay attention to the cell balance every couple of months (if at all – depends how obsessive you are).